Do you love using Escape Room activities, but hate the prep? Then look no further, this resource is low prep and highly engaging. It can be used with or without technology and requires no lock boxes or elaborate set ups! Essentially, students will work through 5 levels of rigorous questions and along the way gather a 5-digit code to unlock the next level. If you use technology, they will type it into the Google Form, but if you are not using technology, you would just check their 5-digit code with your answer key. If they get it right, they can advance to level 2, but if they get it wrong, they must figure out which question(s) they got wrong in order to advance. Slow and steady wins the race! After visiting the Ron Clark Academy (RCA), which if you haven't had the opportunity to do so, I highly suggest it! It's an AMAZING experience and really life-changing. I saw this concept used there, so I adapted it and changed it for my classroom. My students are always begging me to play this! Escape room style math review. 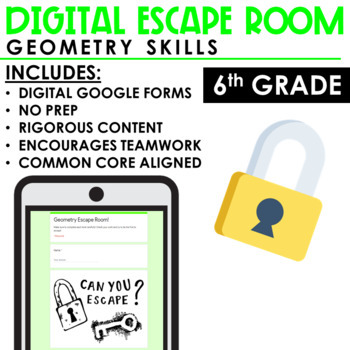 This escape room will review geometry, in a fun, engaging way! 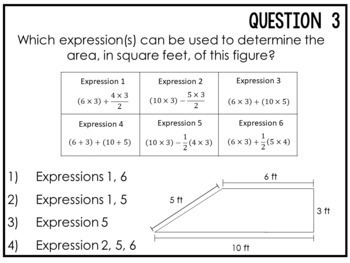 It covers the 6th-grade CCSS 6.G.1, 6.G.2, 6.G.3, and 6.G.4. Content covered includes surface area of 3D shapes (triangular and rectangular prisms, square pyramids, etc., area of polygons - parallelograms, trapezoids, triangles, etc., and volume. There are 5 levels of rigorous content they need to work through. 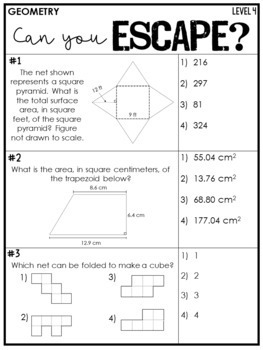 This is a great way to review GEOMETRY content you've taught in 6th grade or a great way to review for 7th graders. 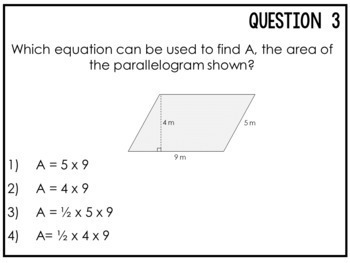 Make the days leading up to your assessment fun with this rigorous and engaging math review. Let's connect and stay in touch for freebies, updates, and more!